NICE RIDE - This Mercedes Benz AMG has a V8 engine with turbo boost and what looks like a carbon fibre bonnet. It really motors. The gold film is plastic but not single use and it looks rather fetching in our view. We love the car, we do not like the gas guzzling engine that contributes to global warming. Copyright © photograph, October 2015, Cleaner Ocean Foundation Ltd. All rights reserved. You may not reproduce this picture without the prior written permission of the copyright owner. It must be very difficult for an entrepreneur when faced with what looks like an opportunity to conserve two of our most valuable south coast assets: Eastbourne and Hastings piers, to just sit on your hands knowing that the operators are in financial trouble. Abid Gulzar jumped in with both feet, not once, but twice. What a hero and at what price? It looks to us as bystanders, that in stretching himself to try and operate two piers and three hotels, that he may have gone a bridge too far. That is not to say that at the time of making those decisions that such a stretch of operations would not have been commercially viable, but rather that circumstances conspired to build to a point where cracks in the original concept have appeared. In this case in the form of financial difficulties. In the words of the House of Lords, "You cannot give a business man a tool and then expect him not to use it." The Cleaner Ocean Foundation awarded Mr Gulzar an honorary title for 2018, for his work in trying to make Eastbourne and Hastings piers work with a view to keeping them open for the public to enjoy. Coastal tourism depends on attractions such as these piers, that while they may not operate at a profit, they nevertheless add to the interests of both towns such as to be an integral part of the seaside package, that holiday makers expect to see when visiting the south coast of England. 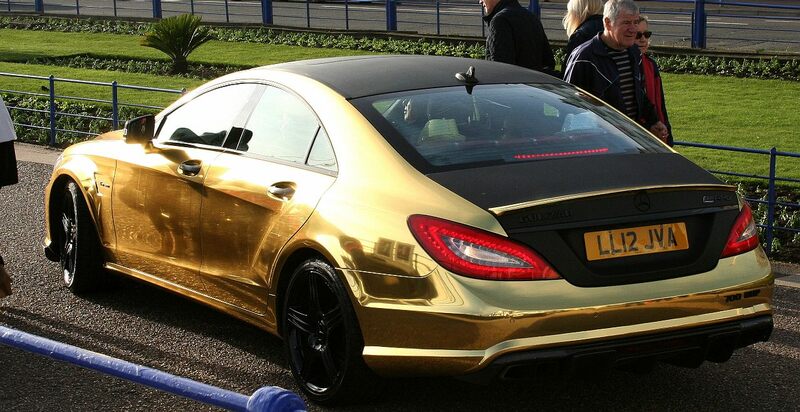 GOLD MERCEDES - This is the car that was recently attacked by a local woman who is being prosecuted by Sussex police. It is though a lovely ride and Mr Gulzar is a very capable driver. The gold film is a plastic wrap that appears to be rather well applied. The petrol engine burns fossil fuels that contribute to climate change. Copyright © photograph, October 2015, Cleaner Ocean Foundation Ltd. All rights reserved. You may not reproduce this picture without the prior written permission of the copyright owner. In our view such philanthropic endeavour should be recognised for what it is by the HMRC, and perhaps special consideration given to what one might describe as misdirected focus, in not paying sufficient interest to hotel businesses that were of lesser archaeological interest, while pushing ahead with challenges, the enormity of which could not possibly have been foreseen or foreseeable, by the controlling mind of so many concerns. Frequently, charities have a trading arm, where profits are donated from fund raising operations to a not for profit aim. The operation of hotels to pay for the upkeep of the Hastings and Eastbourne piers might be viewed in this way. Indeed, in working on the ground to deal with day to day issues, the overview situation sometimes eludes entrepreneurs, in their quest to achieve what many people might view as impossible. On the flip side of the coin, HMRC appear to have taken the view that Mr Gulzar is stretching his finances too thinly in seeking security from one business to cover the liabilities of another. In company law, each company is a separate entity, but it may be that where the controlling mind of a group of companies is concerned, the corporate identity of each individual concern may be compromised. That would then explain the actions of HMRC. It all boils down to whether or not Mr Gulzar has the assets to cover trading liabilities, where the British purse is potentially at risk, that may be deemed insolvent trading where a business is untested. 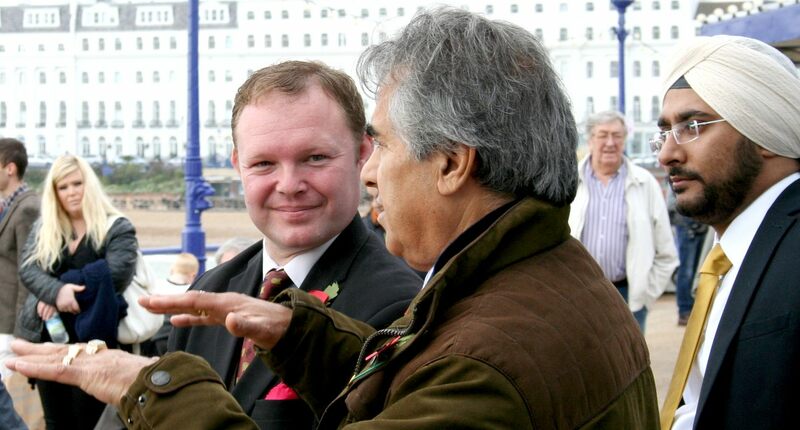 PUBLIC CONSULTATION - Very sensibly, when he first bought Eastbourne pier, Mr Gulzar invited the public to say what they thought the future of their pier might be. Unfortunately, this event did not yield any ground breaking solutions. Seen here are Brett Mclean, Abid Gulzar and Manas Singh. Copyright © photograph, October 2015, Cleaner Ocean Foundation Ltd. All rights reserved. You may not reproduce this picture without the prior written permission of the copyright owner. One possible solution and a very simple one, is for Mr Gulzar to provide the security asked for, such as to alleviate the risk of insolvent trading. Insolvent trading is not an issue where a philanthropist is underwriting a difficult phase. Indeed, all businesses start from director's loans or a business loan based on ordinary commercial risk. Another solution is for Mr Gulzar to defend his non-compliance by showing that the Order was poorly founded. One way of doing this would be to show that his total assets exceed his liabilities, when a Court may take the view that he is not trading insolvent - and that in the round there is an acceptable risk to the public purse. It is an interesting situation where the value of the piers may come into sharp focus. The value of Hastings pier is at the moment a negative asset on the balance books. We understand that it was purchased at a knock down value for £60,000 on the basis of insolvency. This is despite £14,500,000 million pounds of public money being spent in the restoration. If it is a loss maker, it will be difficult to argue a greater value for it, without arguing opposing points of law at the same time. No Court will tolerate arguments thus: non transit in res judicata. 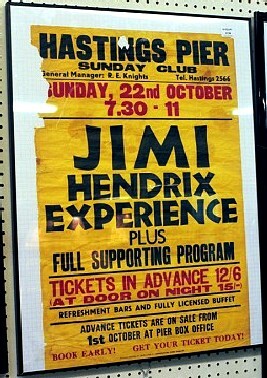 Then there is the value of Eastbourne pier, another deemed loss maker, unless of course the accounts reveal otherwise. It was deemed to be a liability when Mr Gulzar purchased it. Cuerden Leisure could not wait to dispose of it. 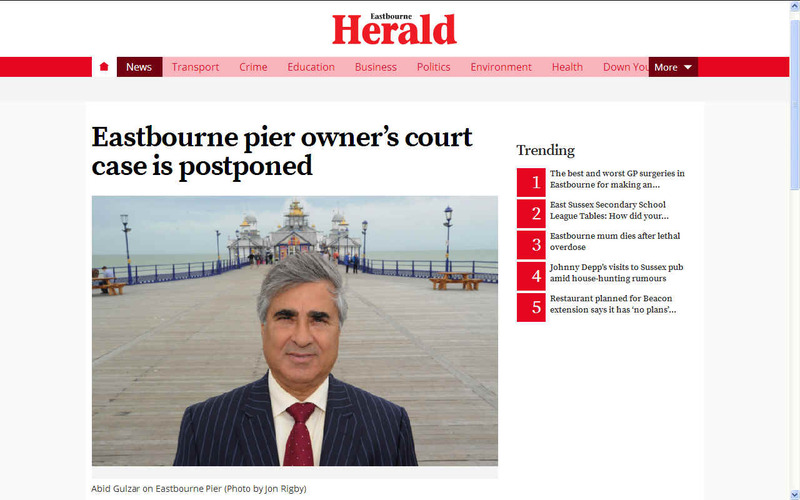 Hotelier and pier owner Abid Gulzar appeared in court this week in connection with tax issues. Seventy-three-year-old Mr Gulzar faces charges of non-compliance along with two of the companies he is a director of – Albany Lions Hotel Ltd and Mansion Lions Hotel Ltd. However, according to the court, the hearing has been adjourned until February 27. Mr Gulzar and the two companies are charged with failing to comply with Pay As You Earn regulations. HMRC alleges that in July 2018 Mr Gulzar and the two companies were asked to pay cash up front for Pay As You Earn and National Insurance contributions in relation to new businesses because of previous unpaid bills with companies that went into liquidation. HMRC alleges non-compliance with that request. Mr Gulzar bought Eastbourne Pier in 2015 and Hastings Pier in 2018. HMRC says notices of requirement to give security for both PAYE and NIC liabilities were issued to Mansion Lions Hotel Ltd and Albany Lions Hotel Ltd and Mr Gulzar, as the director and 100 per cent shareholder of the companies. 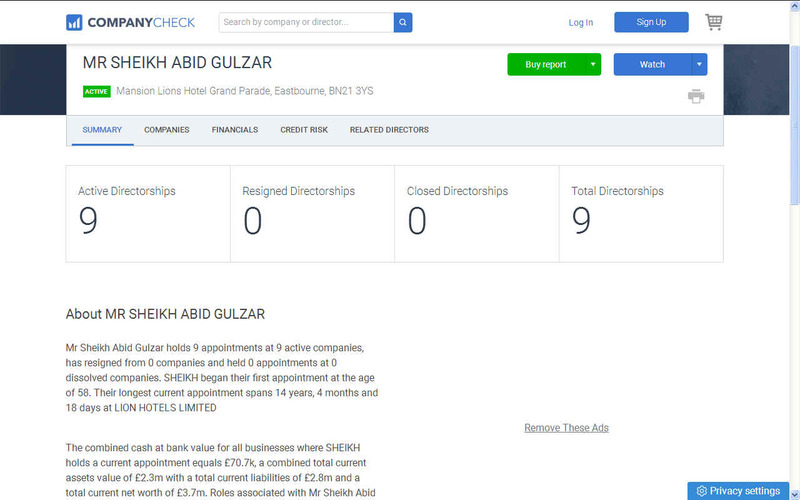 The combined cash at bank value for all businesses where SHEIKH holds a current appointment equals £70.7k, a combined total current assets value of £2.3m with a total current liabilities of £2.8m and a total current net worth of £3.7m. MISTER OCEAN - There is little doubt that much good work has been undertaken on Eastbourne pier, though the historic blue room is still absent, this is most likely due to the difficulty in raising funds privately where conservation of the town seafront is the main planning concern, to keep the piers looking as they were, such as to compliment the seafront buildings. Hastings and Eastbourne are not fairgrounds, but could soon become like Blackpool pier, if inappropriate development were allowed to proceed, even on a temporary basis. Why? Because temporary has a habit of becoming permanent. See Brighton pier where that is exactly what happened. The £14million Battle of Hastings: After a self-styled 'Sheik' bought its famous pier for just £60,000 despite a multi-million pound referb, he installed tacky fake animals and blaring music... only to close it down again - leaving locals fuming. 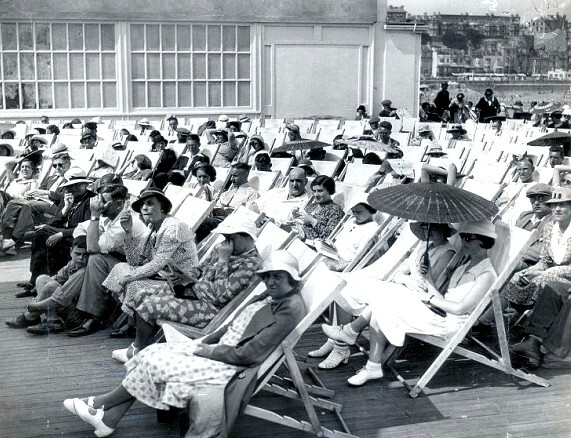 On a crisp winter’s day, the residents of Hastings enjoyed nothing better than strolling along the resort’s Victorian pier and gazing out at its panoramic views of the English Channel. But last Saturday, there was an angry protest of about 250 people stretched out in a line from the padlocked wrought-iron gates along the promenade. The object of their ire was the pier’s new owner, self-styled ‘Sheikh’ Abid Gulzar — a flamboyant businessman disparagingly known as ‘Goldfinger’ because he drives a gold-coloured Mercedes sports car and wears pebble-sized gold rings on each finger. Already appalled he was allowed to buy the Victorian relic last summer for just £60,000 — despite the fact it had recently been magnificently restored with £14.5 million of public donations and Lottery money — they are incensed he has closed it down for winter. Mr Gulzar claims he was forced to do so because it was unsafe after being targeted by saboteurs and vandals displeased with his tenure. His opponents believe it is a cynical ploy to cut costs during the quiet season. They have many other grievances, accusing him of cheapening the 300-yard pier — whose designers were awarded the Stirling Prize, the architectural equivalent of an Oscar — by festooning the decking with fibreglass zoo animals and playing constant pop music over the loudspeakers, and behaving ‘like an 18th-century mill owner’ to staff. Indian-born Mr Gulzar counters that there are racial overtones to the campaign against him, depicting his ‘enemies’ as an unruly mob who’d like the pier to be run on ‘donations, grants and government handouts’ and ‘want everything for free’. The stand-off has turned so ugly that locals have dubbed it ‘The Battle of Hastings Pier’. So what do we know about the controversial ‘Goldfinger’? How did he gain astonishingly cheap ownership of this 150-year-old national treasure, with an illustrious history that includes its use as a World War II landing jetty, and as the venue for concerts by the Rolling Stones and Jimi Hendrix? 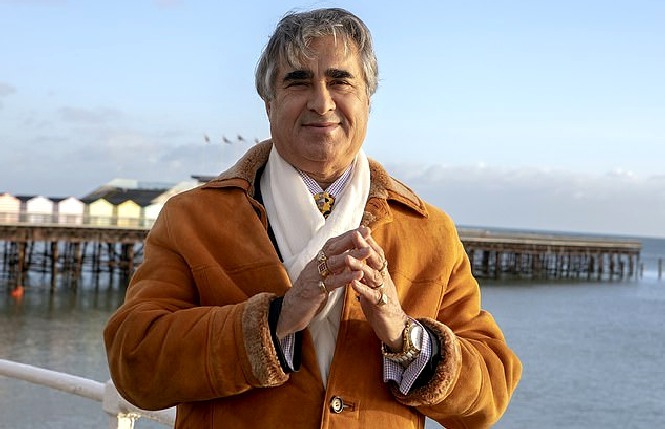 I met Mr Gulzar in the cluttered boardroom of one of two hotels he runs in Eastbourne, 17 miles along the East Sussex coast from Hastings, and where he also owns the pier. Being an inveterate self-publicist, it wasn’t difficult to glean his backstory — or at least his colourful version of it. Whatever his enemies think, he is certainly an engaging character; a fierce British patriot (a signed portrait of Baroness Thatcher hangs in his hallway) and dandyish dresser with a gold tie adorned with Grenadier Guardsmen. His penchant for gold (the fake variety) is everywhere — most items in his office appear to be made of the stuff, from elephant-shaped tea-pots and goblets to giant pineapple statues. V8 TURBO - Abid Gulzar and friends @ Eastbourne pier before the domes were painted gold. It turns out the the domes may have been golden at some point in the history of the pier. Indeed, they look rather plain here. We are sure that Goldmember from Austin Powers, would love this car - a great show stopper. We do not think that Mr Gulzar should have to defend his marketing scheme, save perhaps for the cheap plastic element of some of the adornments, but then real gold would cost the earth and weigh a ton. Copyright © photograph, October 2015, Cleaner Ocean Foundation Ltd. All rights reserved. You may not reproduce this picture without the prior written permission of the copyright owner. 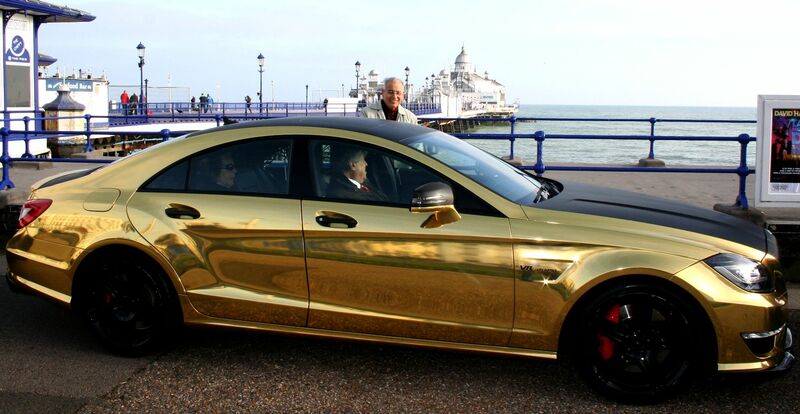 After buying Eastbourne Pier — or ‘Sheikh’s Pier’ as a banner proclaimed it — for a reported £1 million, in 2015, Mr Gulzar controversially painted its domes gold and embossed its 50 lamp posts with golden lions (his favourite symbol) without planning permission. ‘I’ve loved gold since I was a child,’ he chuckles. Yet almost in the next breath, he is complaining about his ‘Goldfinger’ nickname, saying it was invented by his enemies to besmirch him. ‘If I liquidated everything, yes I’m worth good money, but in no way am I a multi-millionaire — the man with the gold fingers and gold car,’ he snaps. ‘I mean, it’s crazy? What man has a car made from solid gold? I just covered the Mercedes with gold wallpaper! Rant over, he runs through his biography. Born in 1945 into an entrepreneurial family of Punjabi leather tanners, he attended a Himalayan boarding school and his father served with the distinction in the British Raj. He arrived in London at 19 and worked in the leather business before buying houses and shops. However, he was ‘disowned’ by his family for marrying a German, with whom he had three children before they divorced 20 years ago. He then wed again and had two more sons. Tears fall as he recalls how one — a teenage soldier — was mysteriously shot dead when visiting his girlfriend in Switzerland. His third marriage, to a Pakistani woman, was short-lived. After these marital travails he escaped to Eastbourne and worked ‘seven days a week’ to build his business. ‘For the past 18 years I have lived in the bridal suite at my hotel — without a bride,’ he says balefully. He admits he is not a genuine sheikh, saying nor does he pretend his business career has always run smoothly. Yet the failings never seem to have been his fault. However, legal records and Companies House documents reveal his chequered corporate history. In January 2017, two of his Eastbourne hotel firms — Lions Hotels Ltd and Chatsworth Hotel Ltd — went into liquidation, owing around £2.5 million to creditors. Mr Gulzar is also sole director of a string of other ‘dormant’ companies which have outstanding county court judgments against them running into many thousands of pounds. In 2013, he was fined £45,000 and ordered to pay £90,000 costs for damaging a conservation site at Pevensey Levels in East Sussex, where he owned land and had planted non-native trees, and erected various structures without consent. Then, five years later, a tax tribunal heard how he had racked up debts of £640,000 to HM Customs and Revenue. Mr Gulzar assures me he has paid off all these sums. In Eastbourne, he seems to be a well-liked figure, praised for his charity work. His decision to ban dog-walkers, picnickers and fishermen from the pier did not go down well, though, despite the National Piers Society being impressed by the improvements he has made. A glowing testimony. Why, then, is he so unpopular in Hastings? 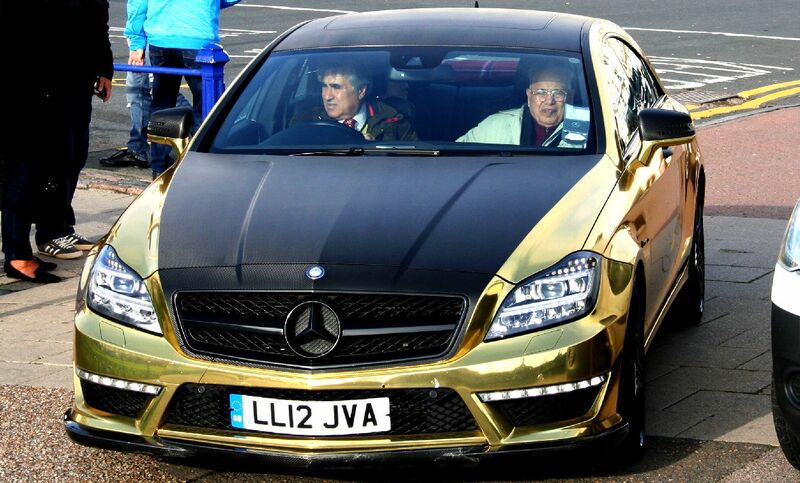 Well, in a struggling town with high levels of deprivation, driving around in a gold Merc can’t help. But the main concern is his stewardship of the pier. For many years it was run by an offshore Panamanian company and fell into disrepair. In 2008, structural damage forced its closure and two years later it was almost completely destroyed by fire. A community group raised almost £600,000 and secured a further £14m from the Heritage Lottery Fund to save it. The resulting facelift, by London-based architects dRMM, was deemed ‘a masterpiece of regeneration and inspiration’ by the Royal Institute of British Architects. Its running was entrusted to the Hastings Pier Charity, whose noble aim was to turn its vast, open decking into a ‘community space’ — but, much as locals liked the idea, it failed to generate sufficient income. By November 2017, it entered insolvency and administrators Smith & Williamson sought a buyer. 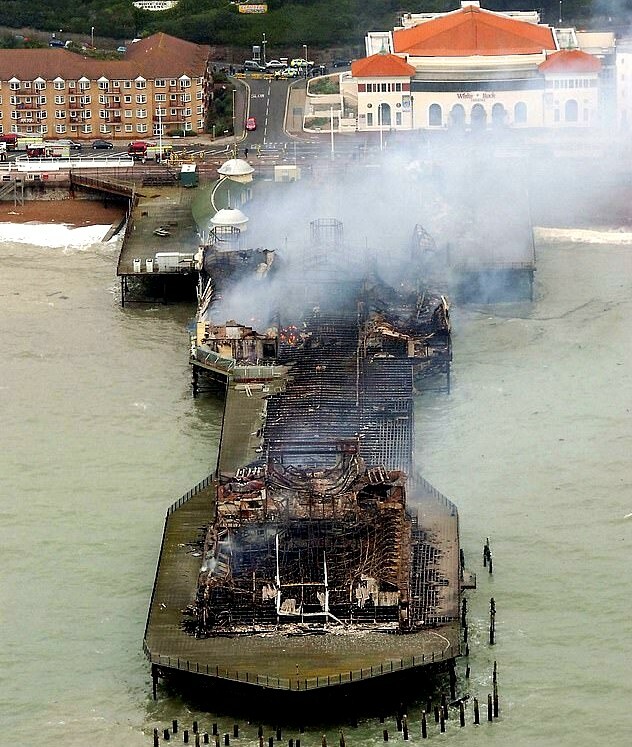 They say they received ‘five firm bids’, including one from a community group, Friends of Hastings Pier (FOHP). Mr Gulzar’s initial gambit was just £30,000, which he doubled after FOHP — who’d amassed a war-chest of £750,000 and had an impressive five-year development plan — opened with an offer of £55,000. He was awarded ownership, and there was astonishment that he had paid so little for a pier that cost the public £14 million. 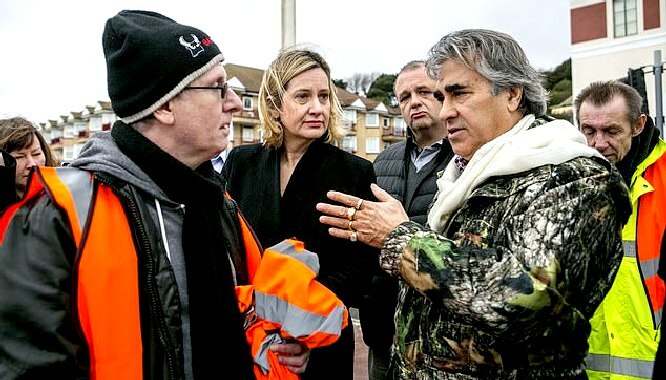 The borough council leader complained and FOHP have called for a parliamentary inquiry, enlisting the help of local MP and Work and Pensions Secretary Amber Rudd. She was at Saturday’s protest, as was Gulzar himself. In the latest edition of Architects’ Journal, dRMM’s founding director Alex de Rijke voices his shock and dismay. Last week, however, Smith & Williamson defended their decision, which they said was taken in consultation with the Heritage Lottery Fund. Mr Gulzar’s offer had been ‘carefully reviewed’, they told the Mail, and his ability to transact quickly at a time when the pier was making huge losses — together with his ‘proven track record’ — had counted in his favour. The backlash against Mr Gulzar began the night the deal was signed, last June. 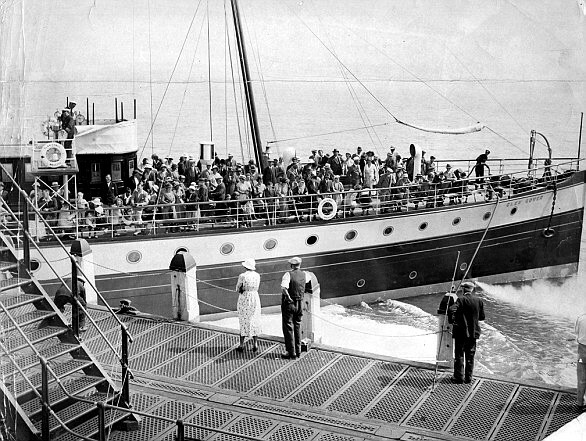 According to Steve Wilkins, 52, then the pier’s duty supervisor, the new owner’s first act was to muster the staff — numbering more than 40 — and call them ‘scruffy’. Mr Wilkins, who had worked as a volunteer at the pier, resigned three days later, followed by a steady procession of colleagues, appalled by the allegedly ‘dictatorial’ style of the new boss and his low-brow vision for the ‘people’s pier’. At least five former members of staff have taken Mr Gulzar’s company, Lions Hastings Pier Ltd, to an employment tribunal, among them former functions organiser Debbie Grant, who was awarded more than £3,000 in holiday pay and unauthorised wage deductions. Mr Gulzar intends to appeal the judgment. Cases have also been lodged by Peter Wheeler, 63, a respected engineer who’d worked at the pier for five years and played a key part in its restoration, plus two members of his team. They have raised £7,500 by crowdfunding to pay their legal fees. Bizarrely, sources say one woman staff member will allege — among other things — that Mr Gulzar offered her extra money to flounce around the pier deck dressed as Marilyn Monroe! staff left was because the new owner declined to pay for vital maintenance to protect the pier’s cast-iron ‘legs’ – which have withstood the tide since the 1870s — from corrosion. Mr Gulzar strenuously denies all these claims. On a tour of the deserted pier with him, he spoke grimly of the supposed plot to undermine him. It began, he says, with pilfering by former staff and grew more serious when vandals removed caps from sewage pipes, smashed the navigational light that wards boats away from the pier, and daubed the entrance sign with graffiti (‘Fake Sheikh’ being one of the more printable insults). Then, in November, a fire broke out in the pavilion restaurant — fortunately it was quickly extinguished. Mr Gulzar is convinced it was arson although Sussex Police say it was caused by an ‘electrical fault’ which was not ‘suspicious’. The most recent incident occurred a day or two before New Year, when burglars broke into the office, stealing a computer and breaking into the heavy iron safe to take a few pounds before dumping it over the railings. It lies rusting on the beach. By then, Mr Gulzar had closed the pier, claiming the saboteurs had rendered it unsafe. According to Mr Gulzar’s public relations man — who styles himself as ‘Lord’ Brett McLean, claiming he was bequeathed his title by a former Hastings councillor — it will re-open on Valentine’s Day. Then, he promises, townsfolk would begin to appreciate the pier’s new owner. There would be new huts selling traditional seaside fare, a dome for concerts and a jetty for boat trips to Eastbourne Pier. But he had to make a profit, so, yes, there might be a slot machine arcade, too. ‘People are attacking Mr Gulzar unfairly — he really does have a heart of gold — no pun intended,’ smiled the so-called lord. Listening to this, his boss nods in approval. He wants to secure the pier’s legacy, he insists, and it will take more than a group of malcontents to deter him. ‘They call themselves Friends of Hastings, but I am the real friend of this town because I put my money where my mouth is,’ he says. Gazing defiantly across the Channel as the crimson sun sets, this stand-off reminds me of the another Battle of Hastings — the one in 1066. And we all know what a bloody affair that was. By David Jones, Tim Stewart and Nadene Ghouri.